Jason Fry has posted his author’s notes for The Secret Academy Part 1 and Part 2. Troy Denning has a new HALO novel slated for later this year called HALO: Retribution. You can pre-order it on Amazon. Details are scarce at the moment though Troy had hinted earlier this year that he was working on a tie-in book. Comics Continuum has a preview of Star Wars #30. In Celebration news, Mark Hamill and Denis Lawson have been announced, and there’s a look at the Star Wars merchandise. Del Rey has also updated their con schedule. The full list of events and panels can be found here, and Jedi News has a nice roundup of the Podcast Stage. Galaxy Comics, Games & More’s Clark Street Anniversary Party is April 1 in Steven’s Point, WI. Star Wars guests include John Jackson Miller. The 3rd Annual Shelby County Star Trek Day is April 8 in Memphis, TN. Star Wars guests include John Jackson Miller. Retrozap‘s Star Wars Celebration Orlando meet-up is April 13 at David’s Club Bar and Grill in the evening. Coffee With Kenobi, Jedi News, Podcast 66 and RandomChatter are doing a meet-up during Star Wars Celebration Orlando at Jock Lindsey’s Hangar Bar on April 15 at 8:30 to 11:30 PM. 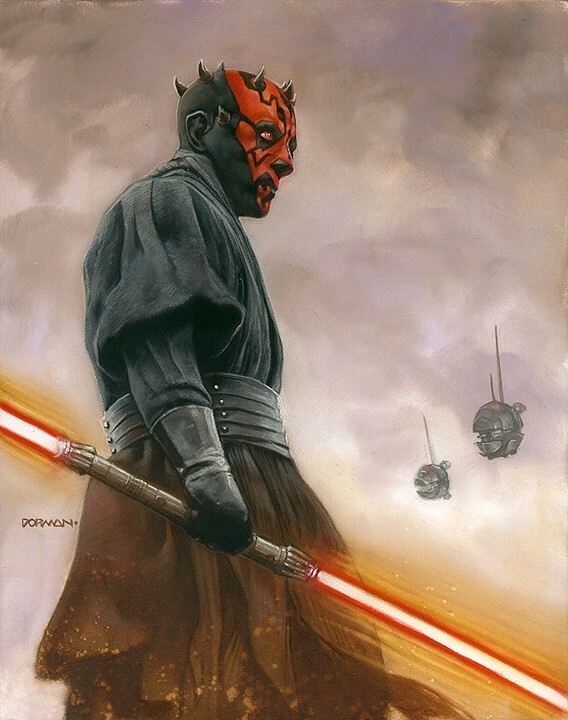 Dave Dorman posted his finished painting of Darth Maul which is absolutely fantastic. …and a final trailer for Ghost In The Shell. It has a trailer now and it’ll be out September 8th. The Justice League has a full trailer now. It’ll be out in November. Fair warning, lots of foul language in this trailer, but this one could be pretty good, Three Billboards Outside Ebbing, Missouri. No release date yet. Sideshow pre-orders are up for the Premium Format Boba Fett and First Order Stormtrooper. The Pennsylvania Star Wars Collecting Society will be offering BB-8 medallions at their booth at Star Wars Celebration Orlando to help raise money for No Warrior without Help. Darth Revan fans will want to check out Gentle Giant‘s premiere guild offerings.